Traffic to your site is spread across an entire cluster of servers. Code it, load it and watch it scale. Traditional hosting comes primarily in two forms, dedicated and shared. With dedicated hosting you pay for the complete resources of one or more servers. You have a set amount of dedicated bandwidth, CPU, RAM, and drive space, and you will normally have full control over the servers resources. With shared hosting you pay for a set amount of space (storage) on a single server, and that server's resources are shared by a number of other websites. The provider is responsible for managing, maintaining, and updating the units. Traditional hosting, especially shared hosting, has its drawbacks though. Because the resources of a single server are shared among a number of different websites, spikes in traffic to those websites can mean decreased performance for your own. Security breaches and other performance issues on other sites make take yours down as well. And there's a single point of failure. If the server itself experiences technical problems, everyone hosted on that server will be affected. With shared hosting, you're also paying for a set amount of storage and processing power. If you have a predictable flow of traffic, this may be a good solution for you. But if your traffic is increasing rapidly, or if you see sudden spikes in traffic due to a new product or feature, you may be constrained the amount of storage you currently have. You will need to adapt by purchasing additional server space to add to your storage space and processing power. But if traffic falls again, you will be paying for resources that you aren't using. Cloud hosting offers a level of scalability that traditional hosting can't. Cloud hosting provides virtual space on an on-demand, as-needed basis. You pay a reasonable price for base resources that are spread out over and entire cluster of servers. 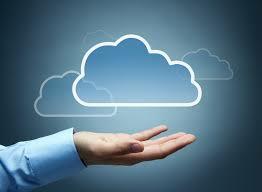 Cloud hosting companies provide Infrastructure-as-a-Service (IaaS). They house, run, and maintain all of the necessary hardware, and the customer pays for the resources they use, similar to how we pay for utilities like electricity. Cloud hosting is more quickly scalable than traditional hosting. If an application or website receives more or less traffic, the cloud servers scale up and down automatically. With cloud hosting, there's no need to manually add or remove server space as there is in shared hosting.